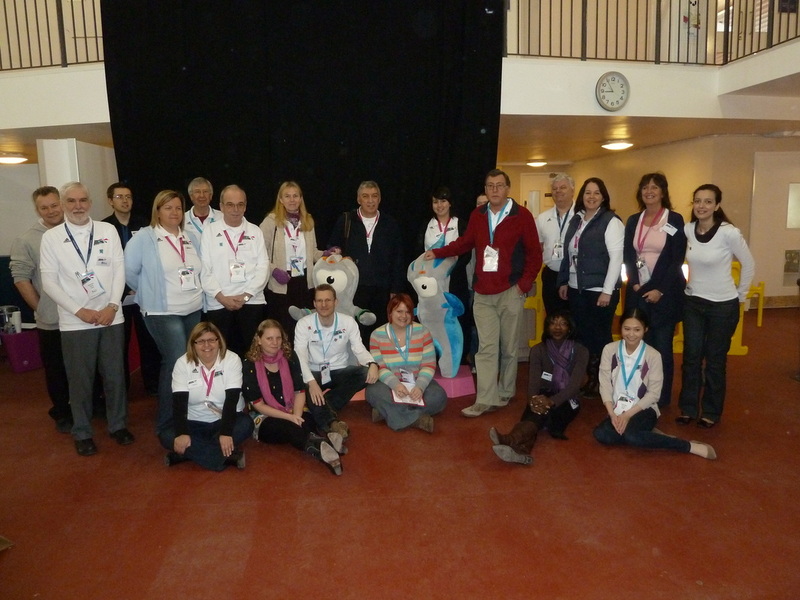 Long before the games actually began on 27th July 2012, I became part of a large team of people that were needed to conduct the tens of thousands of required interviews for the Games Maker applicants. Nearly 250,000 people applied to be Games Makers online. From this initial huge number, around 150,000 were discarded for whatever reason. This left a further 100,000 people to invite for interviews. Ultimately from these, we needed around 70,000 volunteers. Firstly, I was interviewed myself to become a 'Selection Event Volunteer' (or 'SEV' as they were known) - that is, those people who were tasked with interviewing the 100,000 applicants who wanted to be Games Makers. 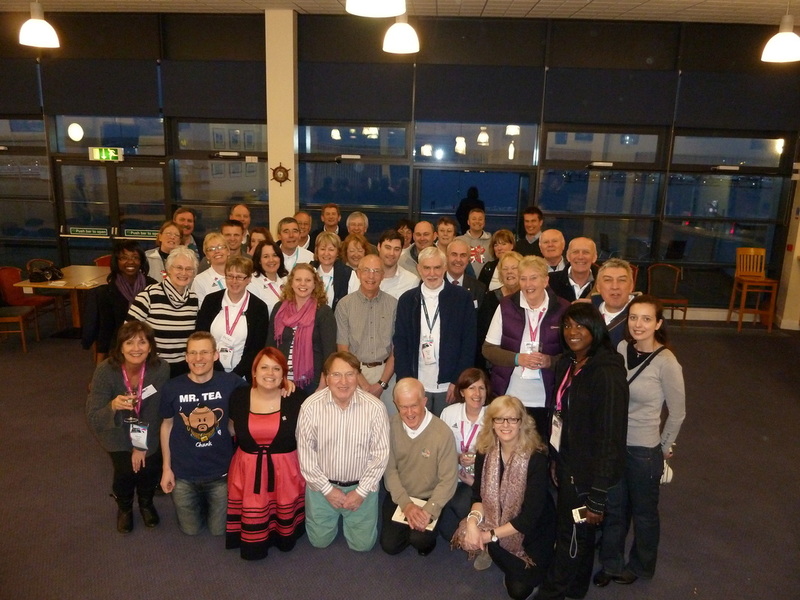 The London 2012 games would need a huge number of volunteers to make the games a success. LOCOG (The 'London Organising Committee of the Olympic Games') were the organisation that were tasked with putting this logistical effort together. Back in 1948 when the games were hosted by London for the second time, volunteers were recruited for the very first time. For the 2012 games, an estimated 70,000 volunteers would be required. Without volunteers, it would not be logistically possible to host a modern games (or at the very least, it would be prohibitively expensive). In order to tackle this vast recruitment process, (the largest peacetime recruitment process in British history) - LOCOG needed to firstly recruit a small army of people to conduct the 100,000 or so interviews that would be required. A mammoth task. So this is how my journey began. On the 2nd of December 2010, I received an email from LOCOG, asking me if I would like to be considered for a pre-games role, to help conduct Games Maker interviews. Obviously this was a no-brainer....of course I did! To the left is the email I received on 2nd Dec 2010. I believe I was one of the lucky people to be sent this email because on my original volunteering application form, I mentioned that I conduct I.T training around the world for bank staff within Standard Chartered Bank. When I actually went to Portland and met up with the other potential SEV's, I noticed that nearly all of them had worked in 'HR' in various companies. 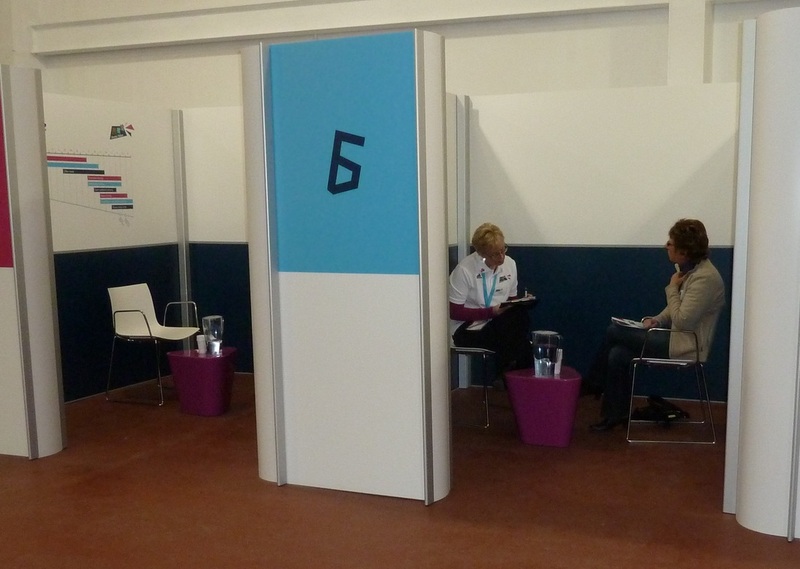 So basically LOCOG were trying to recruit people who had experience in interviewing and/or dealing face to face with people. (Makes sense). We spent a day in Portland (at the National Sailing Academy) being given lots of information and basically explaining what our roles would be etc. Then we were each interviewed. 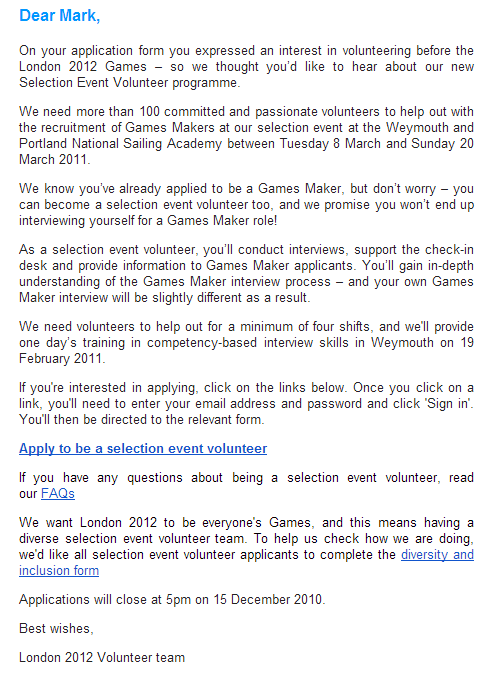 On the 20th January 2011, I received an email congratulating me and offering me a Selection Event Volunteer role. 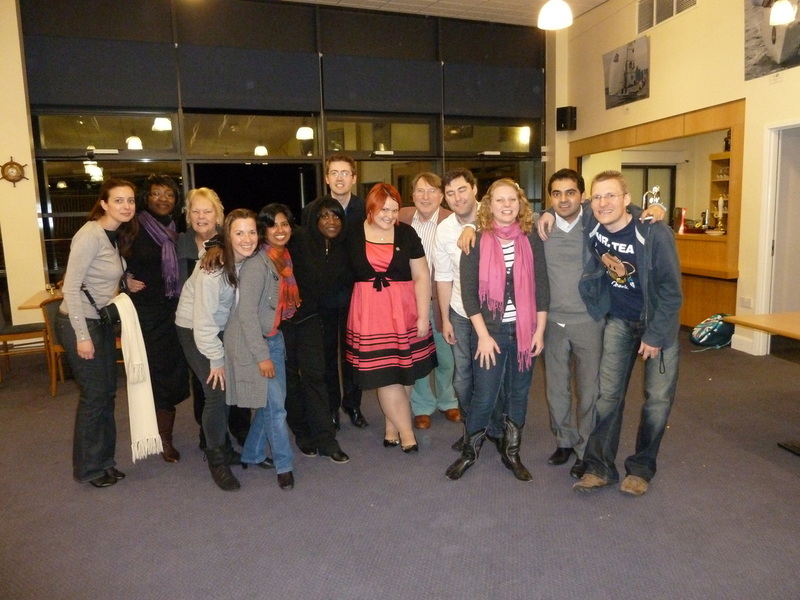 Next I had to attend a day's training session on the 19th February and then I was off and running! The two images below show part of the Selection Event arena that each potential Games Maker would visit and hence where their interview would be conducted. 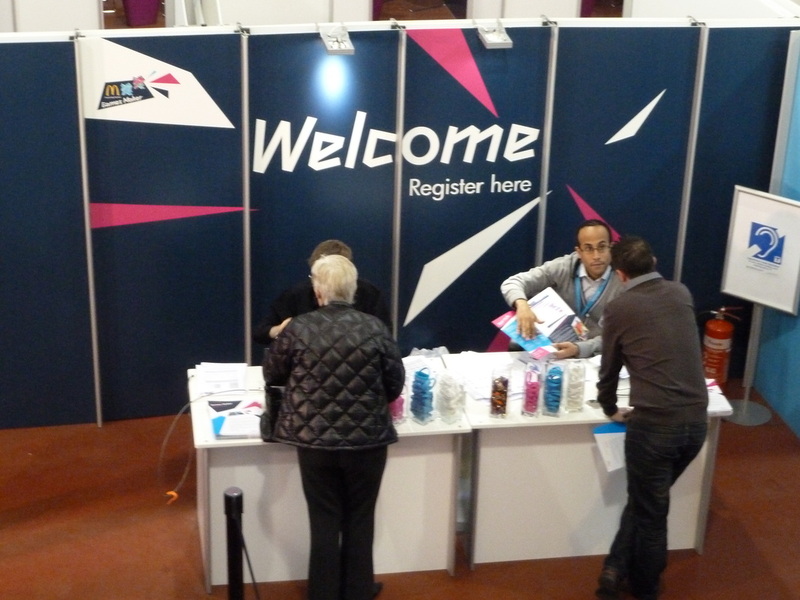 Firstly each applicant would 'check in' and grab some free sweets which were in pots all over the place. They were provided by Cadburys (boy did we eat a lot of sweets!). They were also given a booklet detailing the process and a coloured wristband (so we could track them and call them forward together in groups). 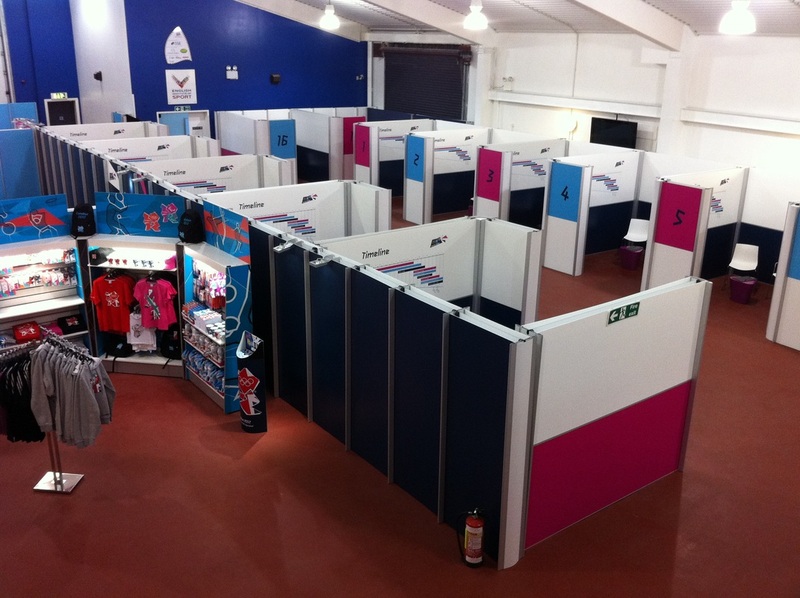 These interviewing pods became our little homes during the daytime, as over the days, wave after wave of people came through the door (shown below left) - after watching a pretty dodgy video! (Actually the video wasn't too bad, but it did contain an awful section that was basically a plug for Cadburys, who were the official 'treat provider' of the games). The below four images show the SEV team in Weymouth/Portland. It was pretty cold in this large 'hanger' type building at the sailing academy, and conducting interviews all day long meant a lot of writing - which was often tricky when your hands were so cold! 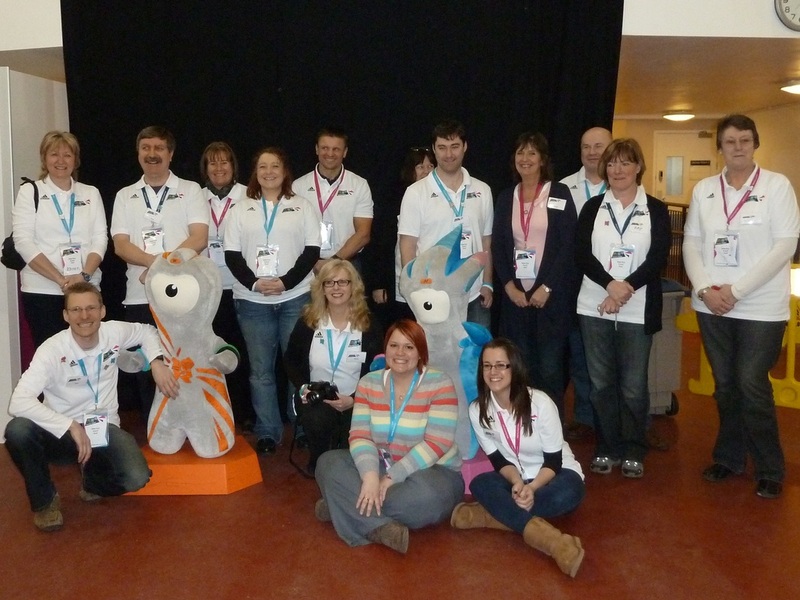 More of the team - and a cuddle with Wenlock! We held our last Game Maker interview in Portland on the 20th March 2011. After this, I helped the LOCOG team pack up and then the entire operation had to go on a nationwide tour of Britain, setting up shop for several weeks at a time. Aside from the permanently set up interviewing arena at London's EXCEL arena, this 'travelling troupe' gave people the chance to attend someone closer to their homes (should London be a struggle for them). This continued throughout most of the Summer and the final stop was in Plymouth. 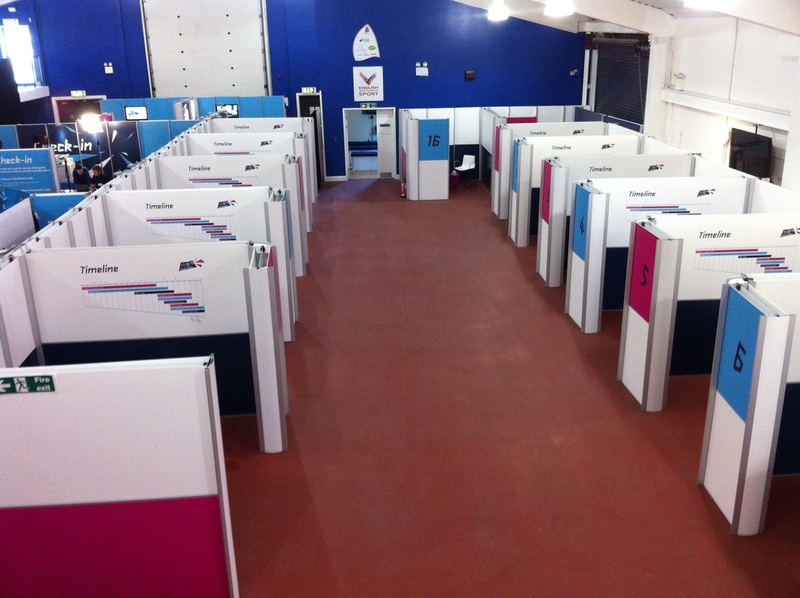 Here, I rejoined the LOCOG team and helped conduct the final batch of interviews for London 2012. As it happens, the 2nd last interviewee for London 2012, came out of my pod!